I'm trying to only back up my contacts as I would like to later set up my iPhone as a new iPhone as I have been having some battery issues. Is there any way to only save my contacts on my PC, reset my phone to factory settings, and then transfer the contacts to my iPhone again? Use iphone pcsuite. You can backup almost everything in there. Then restore the data once you are ready. I did have the same issue with google plus I don't think Its saves contacts picture. I use Win7. And click in "sync contacts with windows" or something like that.. 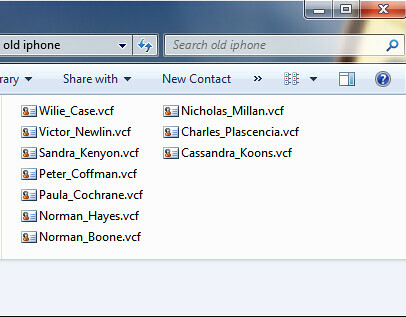 It stores contacts as files in contacts folder which you just can edit or remove to your leisure. Really works magic! To make backup of your iphone better to use windows contact! Hi, how can I extract my iPhone contacts to my Windows Contacts without iTunes??? My dad has a Mac and it is very easy to sync with the Mac Address book. Not the case with PC. If you are looking for a particular computer program to export iPhone contacts to your computer - use Copytrans contacts. Run the program, connect your iPhone and once your iPhone contacts show up, drag and drop them to a location to your PC. Otherwise, you can sync your iPhone contacts with Gmail and once they are loaded in your Google contacts, export them to your PC (you can use a number of iPhone apps which would send the contacts to your email automatically). If you have synced your iPhone contacts to the iCloud, you can also export them from there by logging in to your iCloud account from your PC. Last edited by Wyman; 2012-06-29 at 01:47 PM. thanks. 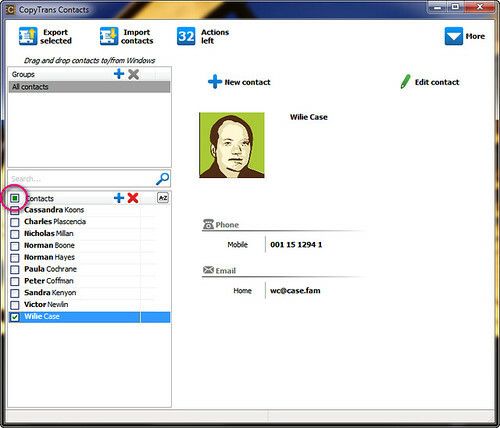 I exported the contacts using Wyman's suggestion. You should be syncing your contact to your computer regularly. It is a bad idea to have your contact in only one place. 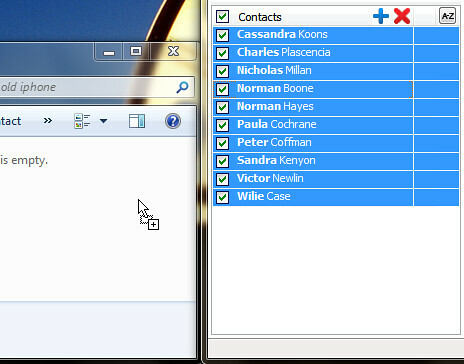 All of your contacts should be on your computer and should be included in your regular backup copy of your computer. What's more,this article how to backup iPhone contacts without iTunes backup maybe can make a effort of transferring iPhone contacts to computer. Hope it worked for me as well. Last edited by billhugo; 2013-02-06 at 01:10 AM. well said billhugo..but i have a problem..My nokia suite has some of my old messages..and when i try to sync it with my mobile I am unable to sync the messages from nokia suite to my mobile but I am able to do vice versa. Can some one help me with this? After connecting the phone to PC.. Open Nokia Suite... Select messages in the Suite and then DRAG-and-DROP in the respective folder next to the Phone Icon at the bottom.. In this case, you can transfer contacts from iPhone to computer or transfer iPhone contacts to Mac, or backup iPhone contacts without iTunes. And Or you can just use icloud to backup your phone to just make sure on iPhone in your iCloud settings. Or you can use a third-party software to help you export the contacts directly, and then backup them to where you want to transfer. Without iTunes , when you backup data to pc or Mac computer, you can use direct data transfer tool MobiKin, itunes doesn’t allow us to transfer the data directly. Last edited by trew56; 2017-06-13 at 03:11 AM.